Are you finding simple way to convert OST Files to EML with all exact objects along with properties? OST to EML Converter Software is the easiest way to complete the OST to EML conversion process at once. This OST Files Converter Software is an efficient & useful OST to EML Tool to convert/move/transfer OST Emails, Attachments, Contacts, Calendar, Journal, Tasks, Notes etc from OST (MS Exchange Server Offline Storage File) of 5.0 / 5.5 / 2000 / 2003 / 2007 / 2010 / 2013 & 2016 to EML (Outlook Express, Thunder Bird, Windows Mail, Windows Live Mail). With the aid of OST to EML Conversion Tool & OST Data Converter Program you can simply & securely convert OST to EML without having any technical knowledge. This Convert OST Software uses advanced technical features for providing trustworthy OST into EML Conversion results in a few countable seconds. 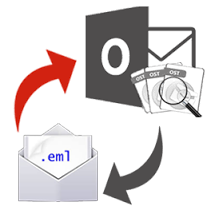 The OST to EML Converter Program is a powerful and easy to use OST to EML Utility to recover OST emails from Exchange OST Files which has been corrupted or damaged due to any reasons such as: - virus attack, synchronizing error, suddenly shut down, software and hardware failure etc and convert them into EML format at once. Easy to Install / Uninstall. Software convert also password protected OST files into EML. Software can easily convert OST into EML (Outlook Express, Windows Live Mail, Thunder Bird and Windows Mail). OST to EML Conversion Tool recovers and converts OST files from encrypted files. Software can smoothly transfer OST into EML, when MS Exchange user an account is deleted by mistake. Software recovers and converts all the email attachments, notes, tasks, calendar, and contacts along with all other components from OST files into EML file. If you are need to convert OST files into EML, then you can easily carry out the procedure with our Powerful OST to EML Converter Utility but, you have to purchase software license (Personal, Business & Enterprise) for saving/storing OST database at chosen place after complete the conversion. You can also contact with our support team for utilizing remote access services to make the OST files conversion process possible.